Victoria Magnani and her team are waiting for you to discover the wonderful world of comics. Well situated in the charming city of Carouge, a 10-minute tram ride from the heart of Geneva, the ibis Styles Genève Carouge is a comic book-themed design hotel. This economic hotel plunges its hosts into a unique and atypical world. 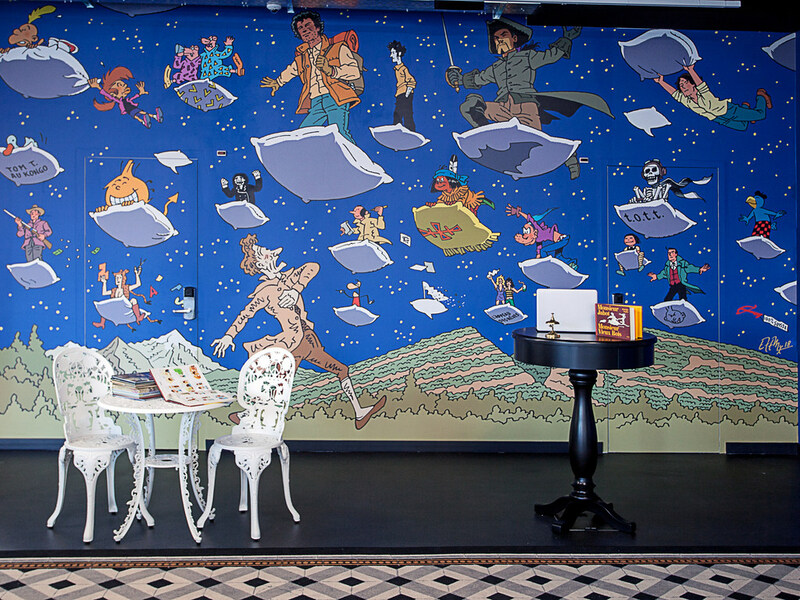 High in color, it offers a range of dream-themed rooms created by local comic-book artists. With free wifi and breakfast included, the hotel features affordable rooms perfect for families, city breaks or business trips. WHAM! BAM! KAPOW! Dive into the wonderful world of comics at the unique ibis Styles Genève Carouge. Genevan artists Zep, Buche, Tom Tirabosco, Exem, Albertine and Frederik Peeters have transformed this comfortable hotel into an enchanting dreamland. Each floor has been decorated by one of these comic-book masters to produce six unique and captivating worlds. So all that's left for you to do is choose your favourite! For a full experience, the concept extends to the lobby with a comic-book library. ibis Styles Genève Carouge is just 10 minutes to Geneva city centre, 20 minutes to the railway station and lake, and 35 minutes to the airport and Palexpo by tram. Embrace your inner child with a stopover at this Lake Geneva hotel! The air-conditioned rooms are decorated with huge dream-themed frescoes. Nothing like a fresh and balanced breakfast that is already included in your rate! Best way to get around Geneva? With the free Transport Card given to you at check-in. Stay connected 24h/7 - Wifi is free. The Café Dessiné welcomes you to relax, work or refuel. Welcoming, modern, unique and decorated around the theme of comic strips, our rooms feature ultra-comfortable Sweet Bed by ibis Styles beds and everything you need for a pleasant stay. Café Dessiné welcomes you to a warm place to discover the world of Geneva comics. We are waiting for you at our café to enjoy a good meal and come discover our menu of cocktails and artisan beers. In a Ludiko Ludo-kitsch setting, enjoy a homemade beer or a cocktail. Very informal, relaxing yet tidy and clean atmosphere. Great, friendly staff. Wonderful decoration in the rooms as well as lobby. Great choice at breakfast. It feels like home away from home. Helpful staff, ideal location, very good breakfast, and decor distinctive. A very memorable experience, and would certainly recommend. This quirkily-decorated hotel is very conveniently located - tram line for number 12 tram for 15 minute ride into city centre is right outside! Beautifully decorated rooms, great breakfasts, really helpful and friendly staff. Good value for money, especially compared to city centre hotels. Must rate as the quirkiest decor in Geneva! Modern, ultra-clean, and very comfortable accomodation. Excellent but simple breakfast choices. Extremely friendly, helpful team are a real credit to the Accor Group and made our stay a real pleasure. Village feel, a short walk from the many small shops in Carouge, yet conveniently located 25 yards from the tram line to city centre. Perfect! My third stay here always a warm smiling welcome to a bright comfortable hotel. Great location great breakfast, love the decor and a great nights sleep. The hotel seems to be in an ideal location. The cleanliness was a non existent. So everywhere over the few days I had in Geneva were extremely expensive. However I found Ibis Styles Genèva Carouge (before Accor locked me out of my own account for no reason) which was a bit cheaper yet still very expensive. However it appeared to have good reviews so I booked it. However I felt that the reception staff were not on the ball and I had to wait to check in. The bar staff were equally slow at serving. The cleanliness of the place left a lot to be desired. My room felt like it had not had a vacuum cleaner in there for a very long time. There were long hairs found on the bedding and in the bathroom. The was crumbs over the floor. And I could write messages in the dust that was very visible on the furniture and it stayed like this for the 3 nights I stayed. And then we come onto breakfast. I was down at 06.40 and only some of the items had been put out even though I had been told it started at 06.30. There were plastic lid tops but no take away cups to actually put the plastic lid onto. All in all a total lack of service, cleanliness and a total could not careless attitude. I absolutely loved my room (thank you for the choice of room with large window and a view). Great decor. Lovely breakfast and great connection to the city centre. Staff were very friendly and helpful. HIghly recommend it! We stayed at many different hotels in Geneva. This hotel is just the right one for us. Carouge is one of our favorite quarters in Geneva. City center is 10 min with the tram. Rooms are very clean and comfortable. We will definitely stat here again. Loved the cheerful front offices staff, extremely nice rooms and nice breakfast. Loved it. Earlier check in ensured we could quickly relax after a long journey. Kids room ajouned ours so plenty of room for all. The receptionist Zahra is very kind! It was a very nice experience to stay at your special hotel. Good location in the lovely Carouge, great rooms and a different but intelligent and beautiful interior decor. The room was immaculately clean. We loved the window seat looking toward the park. The hotel is very well situated and off the tourist path. We are runners and found excellent trails nearby. Staff were friendly and helpful. The breakfast was astounding. Our stay was perfect and when we are back in Geneva we will definitely stay again at your hotel -- we were on the 4th floor (Albertine) and hope to see more of your artists' work on other floors!